Proud Rooster will not allow anyone to offend: aggressively reacts to any comments. Under the influence of Cancer, it becomes even more intolerant to criticism. The man of this combination wants to hear only praise, because he is so wounded and not sure of himself. Although fervent, cheerful Rooster knows how to cheer him up. Such a Cancer has good communication skills, is open to communication and attentive to others. Developed intuition allows him to understand the feelings and mood of people. On a combined horoscope, Rooster-Cancer is a sociable, sympathetic and very trusting person. It is a wonderful conversationalist: he always listens and cheers. It’s not just pleasant to communicate with him, but you can safely rely on his help and support. The benevolent Cancer-Rooster perfectly with all gets along: responsive, attentive and disinterested. People like his thoughtful attitude to life, the ability to hear and understand others. Although the Cancer-Rooster behaves calmly in comparison with others, but is able to stand out from the crowd. Loves to communicate, does not shy away from noisy and cheerful companies. He is well-disposed towards changes, does not lose a positive attitude. Is capable of extravagant antics, emotional and even quick-tempered. He likes to brag, is passionate about the original design things: dresses stylishly and tastefully. Rooster-Cancer pays a lot of time for his wardrobe, not less demanding of others. Likes to give fashion advice, always glad to help in the selection of clothes. Rooster-Cancer craves universal recognition, needs compliments. We are torn apart by internal contradictions, so we are waiting for support from outside. The environment should be treated with understanding. This extraordinary person is characterized by a changeable character, it is difficult for him to understand the motives of his actions. A timid, hypochondriacal Cancer is looking for solitude, and a lively Rooster does not tolerate loneliness and silence. The man of this combination can flare up because of any nonsense, is not afraid to defend his opinion. The main feature of the Cancer-Rooster sign is straightness. Active and persistent in the desire to impose their point of view. Constantly interferes in the affairs of strangers, but more often than not enthusiasm is replaced by disappointment: no one receives gratitude from anyone. Attentive, polite and understanding Rooster-Cancer causes trust and respect. He admires with his disinterestedness, his readiness for self-sacrifice. At the same time it is quick-tempered, unrestrained, able to start a fight. This behavior causes great surprise and even shock among the people. Sometimes Rooster-Cancer not only does not consider the opinions of others, but also does not allow them to speak out. He does not take criticism, is stubborn and principled: he is just perfect — this is not discussed. There is so much passion and strength in him that it is impossible not to obey. At the same time, it is so sweet and gentle that it is difficult not to fall under its charm. This is a talented manipulator and actor: gently and tactfully impose his opinion. But Rooster-Cancer can be sharp and rude, if others do not want to understand it. Sociable, benevolent Cancers-Roosters willingly make new acquaintances. They strive to make a good impression: they like to brag and flaunt their talents. They carefully prepare for each meeting, try to impress the imagination of their chosen one or their chosen one. According to the love horoscope, Cancer-Rooster is a reliable, attentive, but at the same time an insulting and demanding partner. Do not forgive neglect and stinging comments in your address. Family Cancer-Rooster is not looking for adventures on the side: he is devoted to his half and children. He dreams of a strong marriage, does everything possible to make his wish come true. He works a lot, creates ideal conditions for his relatives. Rooster-Cancer lovingly furnishes the house — it’s a born designer. In his family there are no quarrels from scandals, with rare exceptions: sometimes the quick-tempered character of the Rooster makes itself felt. Can take offense at undeserved criticism of the second half or disobedience of children. But he loves them too much to conflict. This person is self-confident, ambitious and ambitious enough to claim a leadership position. Cancer-Rooster is an executive, a responsible employee, knows how to get along with people. However, he is unreceptive to criticism, does not want to discuss contentious issues — he alone takes all decisions. Is an advocate of an authoritarian management style, from employees waiting for responsible execution of their duties. Cancer-Rooster as a subordinate is no less active than in a managerial position. For Cancer-Rooster there are no impossible tasks: find a way to realize your dreams. Aimed at the result - fully laid out at work. So talented that he can master any profession. Likes to be in sight, strives to win universal recognition. Will achieve a career of great heights if he chooses a creative profession: an actor, a singer, a presenter, an artist. A prudent Rooster-Cancer can easily cope with work that requires attention and perseverance: financial and managerial activities. A suspicious and indecisive man tries to appear stronger than he really is. Nature has awarded him with intuition, the ability to delicately feel the mood of people. Cancer-Rooster prefers to hide his feelings and thoughts, is very touchy, does not take criticism at all, but at the same time tries not to lose heart. Cancer-Rooster is an active man, so suffering does not prevent him from solving business issues. Usually this is a fairly successful businessman or a good leader. Carefully protects his inner world from outside interference, he can open only to his chosen one. In a loving relationship, he values ​​honesty, because he knows too well what treason and betrayal are. A gentle, vulnerable woman Cancer-Rooster is looking for a man in the first place a defender. She knows how to love and feel compassion, ready to rush to help at any moment. Needs constant attention, painfully perceives criticism. A timid and calm woman behaves extremely sensibly, although she suffers from mood swings. Can be angry, stubborn and grouchy, at such moments produces an extremely unpleasant impression. It is a great fashionista, has a good taste, loves beautiful clothes. She is intelligent and hardworking, if she wishes she can build a successful career. However, it feels much calmer at home, surrounded by close people. 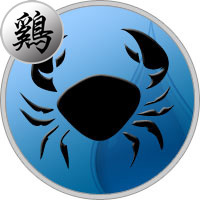 Cancer-Rooster is economical and practical woman, she has valuable advice for all occasions. This is a wonderful wife and a caring mother.